“DISTRICT HONOUR ROLL.” Hamilton Spectator (Vic. : 1870 – 1873; 1914 – 1918) 10 Oct 1916: 5. Web. 6 Jun 2015 <http://nla.gov.au/nla.news-article129387395&gt;. 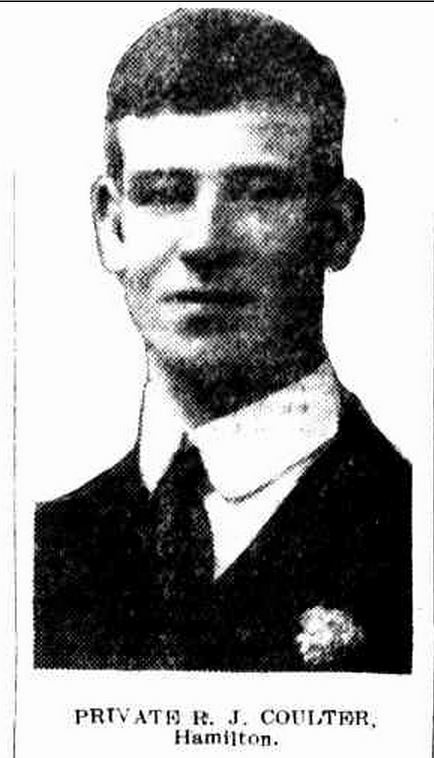 Robert Coulter was born in Hamilton in 1893 to Robert Crawford Coulter and Mary Dobie. Robert Snr and Mary married the year before Robert James’ birth. The Coulter family lived in Francis Street and Robert Snr was a stone-cutter. Robert Jnr attended the Hamilton State School and the Hamilton Elementary School. He was also a scout. After leaving school, Robert worked with solicitor William Melville as a clerk and also the J.Thomson & Co. store. He was a secretary of the Festival Choir. One of Hamilton’s early volunteers, Robert travelled to Broadmeadows to enlist with the Light Horse. He had served with the local regiment in the years prior. He was assigned to the 4th Light Horse Regiment as a driver and left Australia for Egypt on 19 October 1914. The information from Robert’s service record is limited just recording his arrival at Alexandria and then nothing until 7 November 1915 when he died from a pulmonary disease at Heliopolis, Egypt. It could be assumed he went to Gallipoli with the 4th Light Horse. However, there is no record of when and where he fell ill or travel on a hospital ship. Robert was remembered in Hamilton on the town’s war memorial, the State School and Elementary School honour rolls and a tree was planted for him along Anzac Avenue. 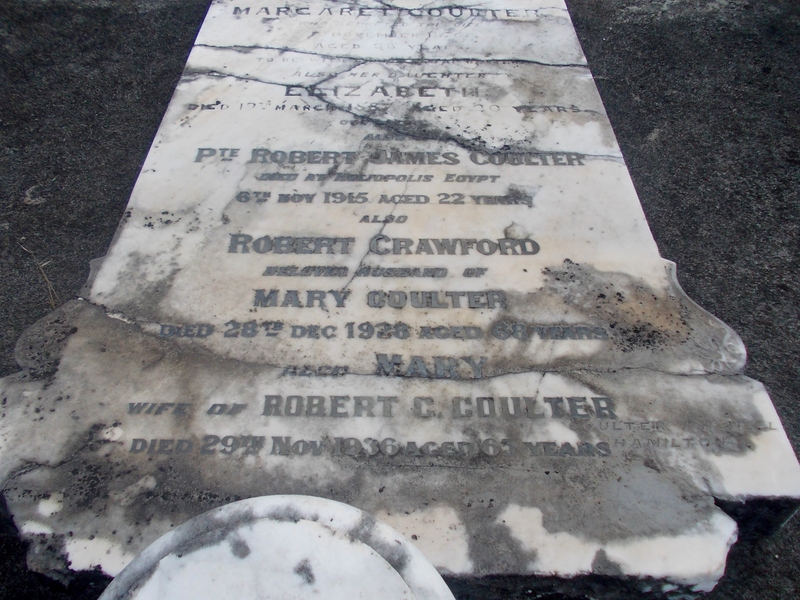 THE COULTER FAMILY GRAVE AT HAMILTON (OLD) CEMETERY.